How do we support council staff working in IWM roles to communicate the role and relevance of water to other departments the within their organisation. Once you explore the diverse goals and objectives of community groups or different departments across councils you will often find a link to water. For example a community group might say ‘we need sports fields or shaded playgrounds’ or an environment department might say ‘we need to prepare a vegetation management strategy or a climate resilience strategy’. When you demonstrate the need for a secure water source (i.e. stormwater, potable, recycled) to achieve their objective, this creates a deeper understanding of how IWM underpins so many areas of council responsibility. This is how we begin to build an integrated perspective and an understanding of the value of water in our urban context. As IWM knowledge and commitment increases across local government we find that councils are skilled at communicating the relevance of IWM to their communities. Clearwater has prepared a series of fact sheets on healthy environments, healthy communities, vibrant centres, economic opportunities and climate resilience. Each fact sheet demonstrates the connection between water and each of the above objectives and highlights how roles in strategy and planning, urban design, engineering and environment, community development, and others, all help make our cities and towns great places to live. 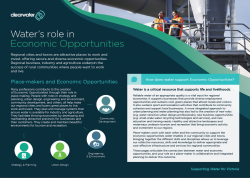 We strongly encourage all water professionals to explore these fact sheets to find the connections within and across organisations and with the desires of the wider community.